One of the main sources of water pollution in urban areas is stormwater runoff. When pollutants accumulate and are flushed into our waterways by rain it can lead to elevated bacteria levels causing wildlife die-offs, algae blooms, and a potential health risk for people. This is in addition to the impact of plastic and other trash that gets caught up in storm runoff. Conservation of resources – including use of native and climate appropriate species to conserve water, energy, and wildlife species. Permeability of ground to allow runoff to filter through healthy soil. Break up concrete and other hardscapes to increase permeable area, and use compost and mulch to maintain healthy soil. Retention of water. By slowing, spreading, and sinking runoff pollutants before they enter our waterways. Rain barrel, curb cuts, and bioswales are all methods to achieve this. The stored water is used by the plants during dry spells. More detailed information on OFGs can be found here. 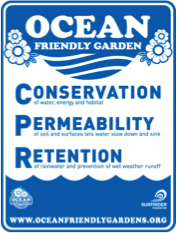 To learn more about our OFG Program and ways you can volunteer, email us at OFG@nyc.surfrider.org.